Do the human roles in space include piloting spacecraft in the traditional sense of maneuvering them via direct control inputs, AKA handflying? 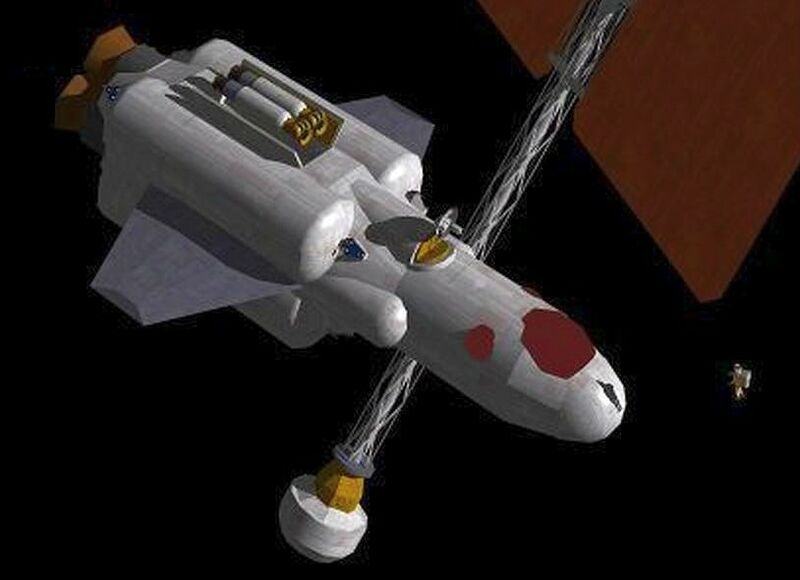 In an old post I said that 'handflying a spaceship is a ding waiting to happen,' alluding to a Progress supply ship that banged into the Mir space station during a Russian test in 1997. But the story is (as usual) a bit more complicated than that. In Russian practice, handflying has always been strictly an emergency backup. And certainly their experience gave them no reason to change their approach. In the American space program, however, things were different. Cosmonauts and astronauts were both originally chosen from among test pilots, for the same sensible reason. The basic mission was to test and exercise human capabilities in space, for which you want highly capable people. Familiarity with complex technical systems that go really, really fast was also seen as helpful. But for institutional and cultural reasons, the early 'Murrican astronauts had much greater influence on how things were done. Mostly it was the whole hot-pilot mystique: Use the Force, Luke! A scene in The Right Stuff - a title that encapsulates this mystique - conveyed the effects it had on American thinking about space. A German-born rocket scientist describes the prospective occupant of a Mercury capsule as a 'specimen,' but his 'Murrican audience hears it as spaceman, a term richly evocative of Romance. A related factor might have been the historical accident that the Russians used dogs, most famously Laika, for space research while the Americans used monkeys and apes. Following in the pawprints of Man's Best Friend was one thing. Going boldly where our relatives from the primate house had gone before was a bit more awkward. In any case, the upshot was that astronauts fiercely resisted being spam in a can, and got their way. Handflying was integral to American human spaceflight from the beginning, and right through the retirement of the Shuttle. Moreover, it contributed significantly to Americans winning the 1960s moon race. Successful handflying of Gemini spacecraft in rendevous and docking maneuvers emboldened NASA to choose an Apollo architecture that required rendezvous on lunar orbit, and the savings in mass allowed the whole thing to go up on one Saturn V. In the mid-60s state of the art, when this decision was made, automated rendezvous and docking at lunar distance was surely a nonstarter. Fifty years later our space technology, most of it, is not much different, but automation is obviously a different story. In the age of Google Cars, handflying is out of fashion, and new generation US spacecraft, both Orion and Dragon2, will reportedly follow the Russians in automating maneuvers, including rendezvous and docking. So is handflying in space an idea whose time has come and gone? Just behind this question, of course, lurks the much larger one of whether human spaceflight itself is an idea whose time has come and gone. Our voyages of deep space exploration have now reached the Kuiper Belt, and the fringes of interstellar space, without their operating crews ever leaving Pasadena or its terrestrial counterparts. It may be that at some point we will send 'mission specialists' to the planets without any need to send spacecrew along to fly their ships. For that matter, even if ship-operation spacecrew are needed, their tasks may not include handflying. But for now, let us consider handflying, as one of the classic skills we once expected of professional space travellers. It is pretty much a given that automated systems can fly routine space maneuvers, including complex ones like rendezvous and docking, more smoothly than human pilots. And probably more safely as well, since robots are less prone to unaccountable lapses that can cause routine operations to go pear shaped. The first question, and the traditional fallback for human intervention, is when things are not routine, and particularly when they have already gone pear shaped. This is nothing to dismiss lightly. So long as things go well, space lends itself to automation, what with Newton and all that. But once things go awry, from instrument failure to erratic maneuvers by another spacecraft, the ability of machines to easily predict the predictable is less helpful. Perhaps even more to the point, the purposes for which we go into space are human purposes, and at some point we probably want human judgment involved. In an earlier post I chose a somewhat extreme example, deciding who to rescue if not everyone can be taken. Commenter Brett rightly observed that the case was somewhat unlikely. But more practical human decision points could easily arise at the scene of an emergency. Suppose a damaged, tumbling spacecraft has injured people aboard in need of emergency medical attention. The rescue ship can break the tumble, a time-consuming process, or perform a somewhat risky maneuver to put medics aboard while the crippled ship is still tumbling. An AI can help weigh the risks, but as Spock might say, cognitive abilities alone are not enough to make that call. And if the decision is to attempt the maneuver, how is it managed? You probably want AI assistance in performing such a tricky maneuver, but giving verbal instructions would be awfully clumsy. A better alternative is to give the pilot something like a 'smart glove'. The glove learns the pilot's reactions - for example, distinguishing between a random muscular twitch and the beginning of a volitional action, allowing more responsiveness than a bare hand on the joystick could achieve. And if the AI packs up or starts singing 'Daisy' the pilot can disengage it and still fly the ship, even if their spirited steed turns into a carthorse plug. This basic technology is something we are at least very close to having now, if we don't already have it. And it harnesses AI as what I believe it fundamentally is: a human mental enhancer. For routine operations we can step back and let AI handle the job. For non-routine operations the AI helps us to do a demanding job more effectively. To be sure, the rescue example presupposes that there are humans in space to be rescued. But the basic reason that human spaceflight is so limited, and controversial, is that it is astronomically expensive. If it becomes merely expensive the justification bar will not be set so high, and in some cases the cost of human presence may fall below that of developing and providing a robotic alternative. All of which still leaves some complex decisions to be made about handflying. If routine operations are automated, how much actual handflying experience do pilots get? And if they mostly sit passively overseeing automated operations, how alert will they be in a sudden crisis? This has already become a problem for highly automated operations such as rail transit systems. As with handflying, so I suspect with much else, not only in space but here on Earth: AI will change many things, but probably in ways quite different from those imagined in conventional speculation about robots. I previously wrote about what AIs want, or might not want, and the relationship between human and artificial intelligence. The image of Snoopy comes from a snippet on YouTube. Forty-six years ago today, the first human being walked on the Moon. And more than 40 years have passed since the last human did so. Those of you who have followed this blog for a long time may have noticed a quiet shift in my position regarding Earth's orbital companion. In the past I have been rather negative about returning to the Moon, while more recently The Weekly Moonship portrayed a space future that included, well, weekly travel there. Most obviously, it turns out that there is a lot of water on the moon; at least a lot of ice in polar areas where sunlight does not reach. The stuff of life is not everything, but it is a big thing, and in particular it can be cracked to make rocket fuel, something that large scale space travel can't get enough of. Provisos apply. A lot means one thing to a scientist, something else to a mining engineer, and we have no idea (yet) whether lunar ice will be available in concentrations that make it suitable for processing. And anyone who thinks that such processing will be cheap or easy needs to cash a reality check: Nothing in space is cheap or easy. Space travel is the most difficult technical challenge that we have surmounted as a race, which is exactly why July 20, 1969, like April 12, 1961, has lasting significance. All of that said, I have revised my perception of the Moon in the human space future, and not only for merely practical reasons. Aesthetics is also a factor, and not unjustly. New Horizons has reminded us - not for the first time, not for the last - of the sheer wonder and beauty of the Universe, including those parts of it that are already within our reach. Seen from close up, at least in the most familiar images - those from 46 years ago - Luna seems rather less enchanting. It is about the color of a parking lot, no inducement to poetry. But while every picture tells a story, those images may say more about the circumstances than the locale. Statio Tranquillitatis, as it is officially designated on lunar maps, is just about the most boring location you can find on the lunar surface. This is for extremely good reason: boring, in astronautics, is a technical term meaning 'probably safe for landing on.' The first human mission to Mars will also land somewhere boring; likewise the first human mission to a planet of Alpha Centauri. Related factors also influenced those first images. The equipment was designed by people who (surprise!) had never gone where it was meant to be used. And the people using it were trained primarily as spacecrew, not photographers. 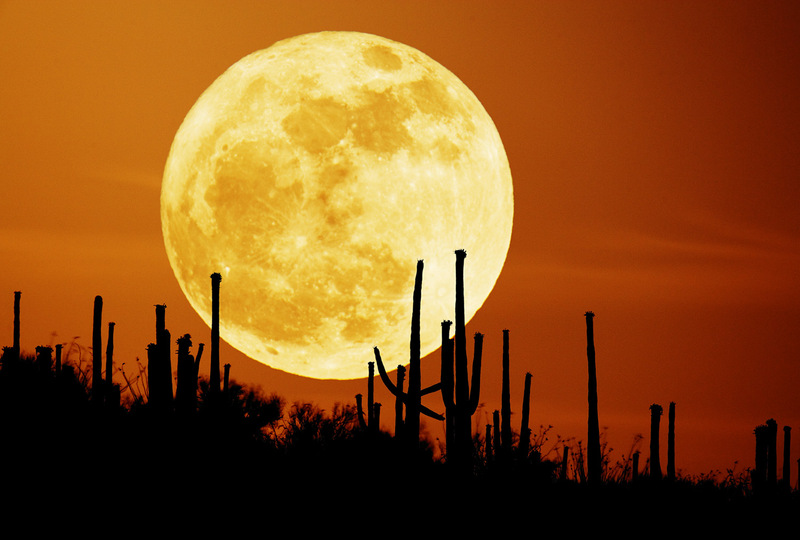 All of which is to say that the Moon can doubtless be as lovely close at hand as from 384,000 kilometers. But the images that will one day enchant us have yet to be taken. Other reasons will, in due course of time, impel us to return to the Moon. And yet others will only be discovered after we do so. Yes, there are other reasons to go to the Moon that are not 'truly' good, merely good enough, and truly human. Such as the reasons we went for the first time. I think the current betting odds are that the next visitors will come from China. One more small step for mankind, but a huge one for any emerging space program: decisive claim of a place at the big kids' table. We will return to the Moon. Not in this decade, probably not in this generation, perhaps not in this century, but surely in the fullness of time. I previously grumped about the Moon - but, really, more about ill-advised hype that ended up setting back our space effort. The image comes from the Astronomy Picture of the Day archives. Probably by now most of you have already seen this image, from the New Horizons probe, showing the remarkable heart-shaped feature on the surface of the King of the Kuiper Belt. 'Remarkable' is fairly weak tea, but my personal stock of superlatives has long since been worn down by the eye candy sent back from our ongoing preliminary reconnaissance of the Solar System. So it will have to do. And I think we can declare Pluto's pity party to be officially over. Future generations of schoolkids will not remember that the largest member of the Kuiper Belt was once classed as the ninth* 'major' planet - and will be increasingly aware that there are planetary systems out there that would scoff at even mighty Jove. * For much of my adult life, in fact, Pluto was not the ninth anything, since for a quarter century or so its orbit carried it sunward of Neptune. If anything, some of those kids might be puzzled by old books, including much rocketpunk-era (and later) SF, that called it simply the ninth planet, back before anyone came up with our current subcategories. Most of all, we can now officially add the Kuiper Belt to the list of places we've been, albeit so far only vicariously. Going there in person will be a demanding mission, and a ways down the road. Well before that time comes, we will return to our previously scheduled discussion of Earth's orbital space. Previous missions have passed through the Kuiper Belt, but New Horizons went there specifically to take a look-see. 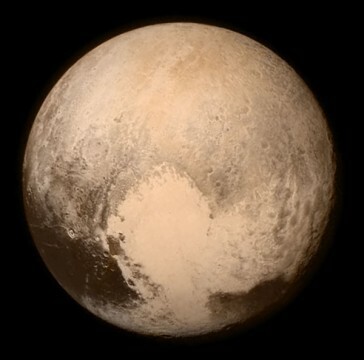 And the heart on Pluto is one of the first things we saw. The image was snagged from Sky & Telescope. We previously considered Pluto here, while it also came up incidentally in an amusing context. And even the phrase 'heart of the Kuiper Belt' got a previous outing here, albeit in a different sense and context, not specific to Pluto. Over the last three posts we have looked at ships and travel in (mainly) Earth's orbital space, and sketched one possible path to an orbital patrol service. So now we come to the post I originally intended to write before necessary preamble took charge: the potential characteristics of Orbital Patrol ships. The image above is unabashedly intended as a rocketpunk-era interpretation, not a strictly realistic conception of a ship built for aerobraking. Hence the forward section inspired by the B-36. Note the spacewalker casting a shadow on the nose. Also note a similar craft serving as forward-end rider atop a deep-space ship in the RM header image. Even more unabashedly, our ship is ready to deliver something considerably more forceful than a warrant. Space warcraft you want, space warcraft you get. * Not in source table; delta v estimates are mine. The difference is that I have expressed speeds (more precisely changes in speed, or delta v) the way professional spacecrew probably will, in meters rather than kilometers per second. I do this for a reason: 3.2 km/s sounds picky, even a bit petty - a mere 0.0000107 of the speed of light. In the conventions of operatic space SF, hardly worth asking the diva to fire up her lungs. But call it 3200 meters per second and it sounds like exactly what it is - fast. As in blink-and-you-missed-it fast, much faster than a speeding bullet, more than ten times jetliner speed. And our baseline ship will be good for nearly twice that much in power burns, plus aerobraking when the mission allows it. A hydrogen-oxygen engine and 75 percent propellant fraction (mass ratio of 4) gives it a total powered delta v of 6100 meters per second, sufficient for all the missions listed. Engines: Typical chemfuel engines, e.g. for kerosene and liquid oxygen, have a thrust/mass ratio of around 75-80. For H2-O2 the ratio is somewhat lower, about 50 - the higher specific impulse means less thrust per gigawatt of engine power output. These figures are for expendable rocket stages. For reusable vehicles structural fatigue becomes a concern, not so easily guesstimated, but let us handwave that progress in materials and design will allow reusable tank structures in The Future to weigh no more than expendable tanks do today. To a zeroth approximation, engine and tankage mass (and the propellant!) are all you need to model a rocket stage. For those playing along at home, try simming some space boosters, bearing in mind that while low orbit velocity is about 7900 m/s, losses from gravity and aerodynamic drag mean that you need about 9700 m/s worth of delta v to place a payload in orbit. A complete, reusable space vehicle will need additional mass for needed features and equipment. Allow 15 percent of ship mass, while aerobraking, for the heat shield. For Earth surface recovery, I'm allowing 5 percent of landing mass, compared to 4 percent of (total) mass for aircraft landing gear. I say Earth 'recovery' to emphasize that even if these ships land on a runway, like the Shuttle, they are not really airplanes. In particular, they cannot take off and fly into orbit; they need a booster stage or two. And recovery by parachute may be more robust. I'm also allowing 5 percent for Luna/Mars landing gear. It may be that ships also tail-land on Earth, using the same gear, but in that case they'll need some propellant for the final descent burn, so we will keep Earth recovery and Luna/Mars landing as separate requirements. Finally, we must allow for all the systems and equipment a robust spacecraft must have - electric power supply and equipment, attitude/maneuvering thrusters and their propellant, and so on and so forth. I am simply going to ballpark these as up to 20 percent of mass without (most) propellant - not precisely 'dry' mass, since it includes payload and consumables. Spacecraft with limited capabilities - such as a recoverable top stage that merely reaches orbit, releases its payload, and heads back down, can get away with less.For aerobraking craft I'll also say up to 5 percent for aerodynamic control surfaces, fairings, payload bay doors, and such. Whatever is left over after deducting for these structures and fittings is payload, or at least gross payload, including the crew compartment and life support, if fitted, and internal bay capacity for any payloads that must be aerobraked. We will call it simply a patrol ship, since the Navy has patrol aircraft, so designated, albeit with a different mission. A couple of notes to make. This ship has heat shielding only for its unfueled mass, so it is implicitly designed for 'low-high-low' missions - starting from low Earth orbit, heading outward to do business, then returning to low orbit (or recovering to Earth) at end of mission. If a ship must aerobrake and then return to higher orbit, it will need shielding for the mass of its get-home propellant, a heavy hit to payload. This ship would need 16 more tons of shielding for the propellant needed to reach translunar space from low Earth orbit after aerobraking, leaving only 9 tons for gross payload. On the other hand, ships optimized for high orbits and lunar space can delete aerobraking and be built as 'pure' spacecraft, using the saved mass for more propellant or a heavier payload. Our patrol ship is not economical for commercial or logistics service. Most traffic will go in ships optimized for their specific missions - design propellant fraction configured to the mission; no landing or recovery gear for orbit-to-orbit ships; no heat shielding or fairings for ships operating on and around the Moon. Even a patrol service may use primarily mission-optimized craft. But I think there will be a place for some ships that can go anywhere in orbital space if need be. As for the design and appearance of these and other ships in orbital space, they will generally resemble the spacecraft we already have, or have had. Non-aerobraking ships can be assemblages of engines, tanks, and modules - more compact, probably, than deep space ships of similar mass, and more sturdily built, since they must stand up to the jolting acceleration of big chemfuel rocket engines. Aerobraking ships are different - in an appropriately 60s-era expression they are aerospace vehicles, and must have a proper airframe. Their shapes are also more constrained. Broadly I think there are two main configurations: a stout cone, like a space capsule re-entry module enlarged to the size of a townhouse; or a more elongated wedge, like the Shuttle and of comparable size. The patrol ship, if capsule-shaped, might be 12 meters high by 14 meters in diameter; as a wedge, perhaps 40 meters high (or long) by 25 meters wide by 8 meters deep. For both configurations, interior volume is about 1200 m3, three quarters of which is propellant tankage, while surface area is around 800 m2. It will be up to the 3D graphics designers to flesh out these shapes - the wedge types surely with wings or fins. Aerobraking ships can freely open bays and extend panels or equipment while in space, but not, obviously, in atmosphere. It is tempting to give civil types the blunter capsule form, reserving the sleeker wedge shape (if you could call the Shuttle sleek) for military or quasi-military craft. This fits the ancient maritime distinction between sail-only round ships for trade, and oared long ships for war. But that is metaphor, not engineering. I am not sure how the trade-offs, probably modest, would actually play out. Larger spacecraft may favor the wedge form simply because it is easier to place on top of a booster stack for initial launch, compared to the very wide and blunt cone. Ships designed for aerobraking will not be assembled in space, not in the early days - building airframes is advanced shop, not like snapping Legos together. Gross payload is 25 tons. As a cargo ship - which it isn't - actual cargo capacity might be 20 tons, allowing for the payload bay structure and fittings. My rule of thumb for a limited-duration (two weeks max) crew compartment is two tons per person, so the ship might carry a crew of 5 plus about 12 tons of removable payload, or a crew of 10 and 4 tons of payload; adjust to taste. My presumption is that spacecraft have a pilot or crew only if their payload is human - either passengers or the crew itself, for missions that require a human presence. Patrol missions are likely in that class, if only because there are some decisions that are specifically human, not for an AI to make no matter how smart it is. Such as, if not everyone can be rescued, deciding who gets left behind. From that sober reflection we may now step back to contemplate the standard patrol ship. And coming full circle, the most wonderful thing is how much it is a true, Heinleinian rocket ship. Granted it cannot lift itself into Earth orbit without a booster stage. Otherwise it can do pretty much everything that rocketpunk-era spaceships were supposed to do. And it does them without violating a single law of physics, or even invoking magitech engineering. Given the requirement and the funding we could probably build it now. In a rocketpunk setting it could even have the classic winged V-2 look. For Realistic[TM] aerobraking you might want to flatten the ventral side, in aviation terms the belly, and fair the wings in to that side so it can surf its own shock wave, but visually it still comes thundering straight out of the 1947 of imagination. We might also have a smaller version, scaled down by a third, weighing in at 25 tons unfueled, 100 tons full load. This model can be launched fully fueled atop the heavy-lift booster, ready to proceed on its mission. It might carry a crew of two, or pilot and passenger, plus a couple of tons of additional payload. Prosaically it might be a VIP transport, but you know and I know that more colorful duties are possible. Hollywood has a name for handy little ships that perform such tasks, but I will call them gunships. And coming up we will look more closely at some of the missions that patrol ships and their gunship cousins might be called on to perform. At some point, traffic control and enforcement would be needed to keep ... impending chaos under control. As more people start working in orbit, the more positive control will be needed, traffic growing exponentially. In a word, yes. A rudimentary framework for space traffic control already exists; I believe that orbital slots, at least in geosynch, are assigned by the International Telecommunications Union. But as space traffic grows, so will the need for traffic management and enforcement, as well as emergency response services. On land these tasks are commonly divided between police and fire agencies; at sea they are combined in the Coast Guard (at least in US practice). The mission will eventually call for suitably configured and equipped spacecraft. And like the Coast Guard and its cutters, the agency and ships will in some broad sense be quasi-military in character. Okay, let's be honest. This blog does not encourage war in space (or anywhere else), but that certainly hasn't kept me from writing about space warfare, or kept you from reading about it. But here I specifically want to look at what may be called 'organic' military or at least quasi-military activity in space - missions that relate to other human space activity, not just earthly power politics. The distinction is important in more than one way. Navies have historically been 'organic' to sea trade (even if the first mission of the Royal Navy was and is to prevent another 1066). For that matter, armies have generally been 'organic' to the lands they defended, oppressed, or both. I think we can draw a broader message from this. The spacegoing equivalent of a coast guard cutter may not match the Romance quotient of a 44-gun frigate close-reaching to windward, a bone in her teeth and her guns run out. But it is probably more interesting technologically and operationally than a robotic battle station designed to vaporize other robotic battle stations or the occasional city. And, most of all to the point, the coast guard cutter is in almost every case a far better delivery vehicle for a payload of adventure. So how does it emerge? I will start with the agency that deploys it, the Space Authority. This rather bland name is inspired by the Port Authority of New York and New Jersey, an agency that in its mid-20th century heyday, under Robert Moses, was notoriously powerful and independent, and reshaped New York City (albeit in ways that are now widely deplored). The Space Authority was founded in 2022 - or it might have been 2012; I haven't double-checked, and in its early decades the Authority was all but invisible. Its overall mission was and is to co-ordinate space activity, assigning orbital slots, enforcing safety regulations, and such. The Authority was set up by the major space launch players, but its guiding force was - and this is not a contradiction in terms - a shrewd, tough, and above all visionary bureaucrat. To avoid endless wrangling over a tiny budget, this individual proposed a dedicated funding stream, a $10,000 fee for every ton placed on orbit. To the power players this was convenient and cheap, the fee coming to about 0.1 percent of contemporary launch cost. Even to penny-conscious Elon Musk it was chump change (and Musk might well have seen through the game and still figured it was worth playing, and paying). And since space traffic had been fairly steady for decades, a few hundred tons annually, hardly anyone expected conditions to change. The Space Authority had just enough money, a few million per year, to rent some office space in Geneva or wherever, and hire a couple of sharp young attorneys as staff. Space law enforcement, in this early era, did not mean spacecraft with flashing red lights. It meant a letter, hand delivered on real paper (lawyers likes that stuff), directing attention to Section 28, Subparagraph h(3), 'Penalty for Noncompliance'. Time marched on, and space traffic volume grew. By the time the moonship Henry Mancini is docked to Airlock 10-A, 100,000 passengers and 70,000 plus tons of cargo payloads are going into space every year, plus the upper stages of the shuttles that put them there. The Space Authority budget is now on order of a billion dollars a year, current value. Still chump change by Pentagon standards, but this is a real budget, enough to charter or buy and equip a couple of ships for special missions - and develop a more capable, purpose-built model. The need may not yet have fully arisen at the level I described, with its 6-8 passenger ships operating beyond low Earth orbit. But it is clearly on the horizon. The primary mission of these first Patrol ships will likely be the noblest: space rescue. Rescue in deep space is problematic at best; the distances are simply too vast. By the time you reach a stricken ship or outpost it probably won't have any survivors left to rescue. But rescue in orbital and local space is a different matter. We have already had a case where space rescue could have made all the difference. Had the extent of damage to Columbia's heat shield been recognized, a rescue mission would have been feasible in principle. I sadly suspect that NASA closed its eyes and grit its teeth because no rescue was possible in practice. Even the Russians, with their simpler, robust architecture, could not have cued up a double Soyuz mission in time, and Columbia was on an orbit that Soyuz, from its high-latitude launch site, probably could not reach. But once space rescue is practical it is necessary, and the Authority needs a ship or two that is up to the job. This means sacrificing operating economy in favor of flexibility and performance, specifically the ability to deploy on short notice and reach as many orbits as possible, meaning plenty of maneuver capability, AKA delta v. Onboard equipment and facilities, in addition to sick bay, likely include storage and support for taxi craft and robo pods used to work around crippled, possibly tumbling spacecraft, plus a miniature onboard Mission Control for directing operations. The first such ships will be handbuilt prototypes, thus costly; the Authority might need to issue revenue bonds to fund the development program. Follow-ons will be less expensive, though still more than commercial models since the mission is more demanding. Say $200 million per ship for a 100-ton ship (unfueled), and $60 million per year to keep each in service, plus propellant for training missions. Perhaps $150 million annually per ship, all up, so the Authority can keep three or four in service. And it possibly has not escaped your attention that the major characteristics of these ships - their flexibility and performance - are very much what you would expect of warcraft. (May the Episcopalian God of my childhood forgive me, agnostic that I am, for perverting angels of mercy into angels of wrath.) Throw in fittings like those (potential) weapon bays and CIC or tactical control center and you have the raw material of a handy basic space warship. Even militarized, these Patrol ships would be no match in sheer firepower for the sorts of weapon platforms the great powers might deploy. But they are far better suited to exerting a presence in orbital space. Über battle stations leave policymakers with a pretty stark options menu - nothing between issuing a sternly worded letter of protest or blowing someone up. A Patrol ship can switch out the medics for a SWAT team, go out to any orbit, arrest someone, and haul them in to face charges. And that is how you effectively and flexibly exercise power, or dare I say Authority, across local space. What are the chances of some such agency and some such ships emerging? Given the scale of space activity I have portrayed - hardly a given - I'd actually rate the chances moderately high, say five percent to 20 percent. Someone will need to do it. The great powers won't trust each other, and won't want to spend their own money on forces suited to keeping order in orbit rather than overawing their terrestrial rivals. Business interests will want some law and order up there without getting too entangled in international power politics. Yet the outcome suggested also would mark, quietly, a beginning for space-centric political structures. Potentially, at least for purposes of opera, it might be a good deal more than that. As noted here before on this historically significant anniversary, the Revolt of the Colonies has been a long-standing theme in space-oriented SF; particularly, for obvious reasons, 'Murrican space SF. But the Patrol as outlined above arises in different circumstances, where there is no Federation, certainly nothing like a world state, only the great-power muddle we have known since 1648 - or perhaps even a more thorough muddle, known to students of international affairs by the wonderfully Game of Thrones-esque name of neomedievalism. In such circumstances, as suggested above, the Patrol is not an instrument of any terrestrial power, but one that arises from the circumstances of space itself, politically embodied in this account by the Space Authority. No one on Earth quite owns it, or can even agree on who should own it. There would likely be no Declaration of Independence, no need for a gifted rhetorician to remake poor old George III into Caligula. Possibly the last thing the Authority wants is to call that kind of attention to itself and its expanding role, and gaining a seat in the UN General Assembly, or successor body, is the least of its priorities. Unless, of course, the overriding demands of story call for a Concord, a Saratoga, a Yorktown. In that case, have at it. The image of the Robert F Kennedy or Triborough Bridge, built by the Port Authority in the Robert Moses era, comes from a blog about NYC area highways. Apart from my institutional reference, what does it have to do with space? Who cares? Bridges are always cool.